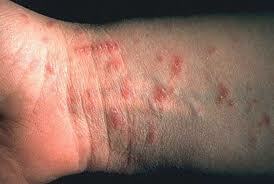 Scabies is caused by infestation of the skin by the human itch mite. The mite burrows and lives in the upper layer of the skin and lays its eggs. It affects only the skin and causes a red rash with a severe itch that is often worse at night. Scabies usually spreads by close contact with an infested person and can spread rapidly under crowded conditions such as nursing homes and communal facilities. The characteristic symptoms, skin findings, and finding a mite on a skin scraping will allow a dermatologist to compare to other conditions such as eczema and dry, itchy skin to make the diagnosis. Upon diagnosis, the patient is instructed to wash all clothing, sheets, and towels used within the last week. Treatment with either topical preparation or an oral medication is effective at eradicating the infestation of the skin.